Control vs. Control is now like "Who can build the greediest deck out there?" PS: she could go straight into an Aluneth deck for increased flavour AND power. Hilariously awesome. Kind of like Elise on drugs. Save this for the end of the game, add 10 cards to your deck. I imagine it will see a metric ton of meme play, and probably some competitive play in the greediest of decks. This is a must run in slow controlly decks. When you have no cards left this gives you 10 new ones (of your choice)! Only downside is how annoying it will be to have to wait for an opponent to pick through 5 sets of discover picks. Discovers herself for infinite game! OK? So this is a counter to fatigue? Obviously. I'm just baffled by the fact, that the 5 cards will be very random. I know, I know - extra resources are always welcome and as a control player I appreciate this aspect (they also delay fatigue). I'm just wondering if those will be good enough to put you in a favourable position over your opponent - remember that Un'Goro Choose Your Path spell? It could discover everything class related - spells, minions (incl neutrals), weapons... It could discover poorly stated basic cards and situational spells. And I'm just wondering if having a dead card almost the entire game is worth it. If Plot Twist forms a Dead Man's Hand combo with Augmented Elekk, then I would prefer that one over the neutral legendary. 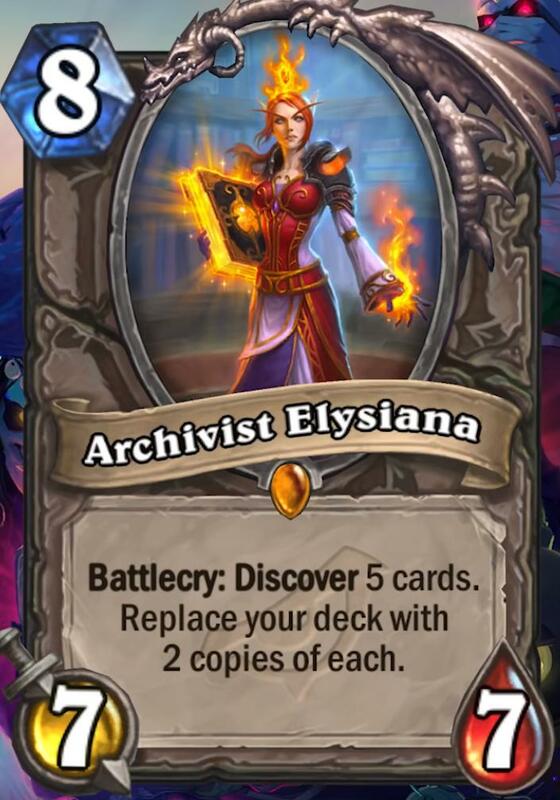 I think Elysiana will still be played, but in control warrior and priest decks. Day one golden craft for sure. Wow, what a card for control players like me. Wow, that's one hot Blood Elf! :) 5 Star Design, 5 star Balance! I don't care if this is any good, I am day 1 crafting this. Do we have any intel on if they will be class specific cards, or complete free-for-all, anything goes cards? Discover at least one copy of Archivist Elysiana. Hakar decks clears the blood and stop fatigue. Will def be usable. I'm going to need some clarification on how this will work. Because I assume if you have no cards you will get at least 10. But what if you have like 3 cards still in your deck or some other random number? This almost feels like the meme legendary of the set but we haven't seen the last legendary (and Harbinger Celestia was the last legendary announced in Boomsday). With that being said, this card gives you 10 more cards to use. It makes fatigue battles a bit more interesting. We'll see how useful it will be in the meta but it will be used if control decks become the meta.